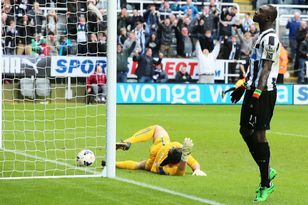 Dan Gosling will this week leave Newcastle United and sign for Premier League newcomers Crystal Palace. A deal is expected to be done over the next 48 hours between the player and Palace, who won promotion in the play-off match in May. This is another clear sign that Newcastle are determined to move on fringe players to make way for new signings, although none have been made as of yet. Gosling, signed from Everton three years ago, has never been able to tie down a permanent place in the Newcastle side, with injury more than any other reason accounting for that. The midfielder has said in the past he would prefer to stay at St James’ Park, but Palace have made a move to sign the 23-year-old over the past few days with his fee believed to be around £1million. Alan Pardew this season. James Perch has been sold to Wigan, there are question marks over Shola Ameobi’s future and now Gosling is being shipped out. Steve Harper and Danny Simpson have been allowed to leave, which does free up places in the squad. It would be fair to say that it never really happened for Gosling on Tyneside, although injury didn’t help his cause. Pardew has never once hinted that he saw Gosling as someone who would make any sort of contribution. He has played just 26 times in his three seasons at United. Darren Bent remains a Newcastle target and Aston Villa have dropped their asking price for the striker to £6m, although they may have to reduce that price for United to agree a deal. Former Newcastle winger Kieron Dyer, meanwhile, is set to retire from football after being released by Middlesbrough.